EZG’s Top Ten of 2015! It’s this time of the year again, my friends! 2015 has been an awesome year for the 3pp-scene. Fact. Beyond a huge amount of superb releases and the start of my patreon, I have branched into other systems – so starting 2016, my Top Ten list will include all game-systems I cover. As always, the list that will follow will reflect my own preferences – and be less about refinement, more about what *I*, as a person, love. So my reviewer’s hat is half off for this. That being said, all of these books are truly superb. One more thing: I have one rule for the Top Ten. If a book or component of it has already featured on the list, a further book that compiles/expands it, is not eligible for the list – this rule exists mainly to prevent the same type of book from scoring multiple times. Before we go into the respective lists, I wanted to thank everyone who supported me over the years and particularly thank the 3pps that continued to step up their game – I have never been able to write this many positive reviews before, with the average quality being exceedingly high. A special, second “Congratulations!” should be extended to every publisher and author who managed to get even one book nominated as a candidate. The significantly expanded book that collects last year’s superb Psychological Combat and combines it with the excellent Leadership Handbook is one of the most-used books in my game. Its streamlining of Demoralize and Bluff and introduction of the Antagonize social maneuver is brilliant. A must-have book and worthy EZG-Essential I use in every campaign! Last year, Matt Finch’s first part of this masterpiece scored on my list and it remains one of the most awesome Underdark Sagas I know; brilliant, evocative and awesome, part II in no way falls short of the superb qualities of part I – but it also very much is an essential second part, one that works best when combined with part I. Hence, I elected to retroactively add this superb book to last year’s Cyclopean Deeps I as a winner of last year’s award – the combination of both is awesome. The original iteration of Snow-White scored on a previous Top Ten; however, this book really made me grit my teeth regarding my own rules – with over 50% new content, absolutely superb production values, huge amounts of glorious ideas…and, more importantly, it features rewrites that eliminate all potential hiccups the original iteration sported. The result is a superbly gorgeous book that is a blessing for one’s bookshelf. All right, so these would be the three superb books that would be on the list, were it not for the aforementioned, one rule I established for myself. If you like horror-gaming…well, then you damn well NEED this. No exceptions. Beyond being basically compatible with the superb Night’s Black Agents, Trail of Cthulhu and similar GUMSHOE-settings, Esoterrorists is mindbogglingly good and inspiring; I was pretty drained regarding Cthulhu and horror and this book totally changed that – by virtue of its smart offerings, concepts and downright awesome adversaries, this (and to a lesser extent, the Fear Itself sister book) humble little book is currently my favorite horror book. Yes, that good. This humble little pdf for Rite Publishing’s Diceless system is actually written in verse…and so is my review of it. Writing it was a joy and beyond being a glorious little pdf, I had a LOT of fun writing the review for it. It has a very low price, so even if you’re not interested in the system, checking it out is a great idea! A wonderful roleplaying game that emphasizes travel, is a superb first setting and family friendly to boot – if you’d ask me for what would be a great first supplement to introduce kids to roleplaying – this would be my recommendation. All right, so all of these out of the way, here is my Top Ten of the best PFRPG-books of 2015! Spheres of Power is a truly evocative, brilliant alternate spellcasting system that literally allows you to play a vast array of unique, different and evocative types of character and construct completely different games – were it not for a couple of rough edges in the deatils, this would rank even higher on this list. Okay, so if you’ve been following my reviews, you’ll know that I absolutely LOVE good environment-sourcebooks…but, alas, there simply aren’t that many. 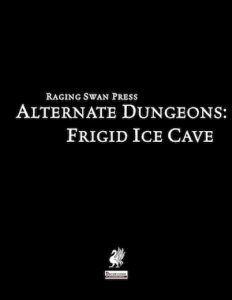 Suffice to say, while I can rattle off a list of underdark sourcebooks or desert/frozen-reaches-themed books, once we get to PLAINS of all regions…there was none. Until this book hit shelves. Fields of Blood is a glorious GM toolbox and inspired a significant array of glorious modules in my game. Oh, and the sample adventures also rock hard. And here, we have what the rogue should always have been. Modular, fun, diverse, well-researched and presented, this is simply superb. This is THE definite rogue for a d20-based game. ‘Nuff said. One of the most beautiful books I’ve ever read, Southlands is a thoroughly inspired, brilliant and creative campaign setting that breathes the glorious spirit of Midgard, that takes a bow to real world mythology and that feels concise, almost novel-like in its superbly evocative prose. Southlands is absolutely superb in every way. What can I say?? I’m a huge sucker for Kaiju, massive high-level foes, super enemies…the like. It was pretty clear I’d absolutely adore this book and the added rules for piloting a Power Ranger-style mecha just complements this further. Awesome. The book you didn’t know you needed until you did – Microsized Adventures is a truly superb book that lets you create a huge assortment of new options, all around shrinking and sizes. This humble book is small, concise, and it opens a huge amount of new ways to play the game, with rock-solid, impressive and complex rules for creatures of vastly different sizes…and size-changes. Get this glorious little book! Joshua Gullion has given us a true gift; when he championed Michael Allen getting the gig to write this adventure saga, little did I know how absolutely mind-blowing this would become: Steeped in Aventyr-lore, this wonderful saga managed to keep its exceedingly high quality, smart premises and diverse environments and progress them through the installments, with none of the modules like the other. Shattered Heart is a truly superb saga and I sure as hell hope it will get an expansion/epilogue in the future -as it stands, it is a superb example of how AAW Games has ramped up their game throughout 2015, releasing a huge array of truly premium modules. Richard Develyn is not only a gifted author, he has elevated adventure-writing to a form of art. At ridiculous 4 bucks per module, you will not find any module out there on par with this bang-to-buck-ratio. The fact that Richard’s modules have continuously not only managed to be nominated, but actually WIN Top Ten-spots in the highest echelons should speak volumes for the quality, thought and creativity that went into every one of them. Not content with simply providing great modules, each has a vastly different style and pushes the envelope of what can be done with a given adventure. These belong in any GM’s library. The literally only reason Ultimate Ethermagic, Composition and Truenaming did not make my list last year was that I knew they’d be collected in this book. The make-it-or-break-it magnum opus of Bradley Crouch sports 3 perfectly balanced, customizable, complex alternate casting systems, all of which feature heavily in my campaigns – whether it’s THE definite manabar/warlock-y system ethermagic, the actually “feels-like-music”-composition system or the impressive and definite take on truenaming, these systems blew me away, each and every one of them. I adore this book and its impact on my games is only rivaled by Dreamscarred Press’ Ultimate Psionics. Okay, this probably did not surprise anyone, right? Sword of Air has been in limbo for pretty much as long as Necromancer Games and Frog God Games existed. No other adventure ever had to live up to such a huge legacy of hype and overblown, impossible expectations. In fact, I didn’t really dare read this for a while…because I was convinced that this would, by necessity, disappoint me. The opposite turned out to be true: It exceeded my wildest dreams. Sword of Air is a huge book – and it needs every damn page in it. There is no other module, perhaps not even a campaign setting out there, which manages to instill this sense of cohesion; with a firm, modular plot-line, it combines the best traits of wide-open old-school sandboxes and narrative-driven gameplay; it brims with unique ideas and ranks as one of the densest, most flavorful campaigns I’ve ever read. There is no doubt – this is a true masterpiece, a once-in-a-decade-level of quality saga that should, even among FGG’s massive mega-adventures, be considered the crown jewel. If I had to take a single adventure to a remote island…I’d probably take this one. Not only is it vast, it can be run in wildly different ways and never is bogged down, redundant or bland – a masterpiece in every way, this is literally a must-own saga if there ever was one. 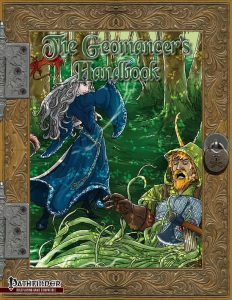 This book very much exemplifies how Frog God Games’ team has honed the craft of each member and combined their significant strengths to turn this into a collective larger than the sum of its parts and if you need to see what’s great about 3pps, old-school gaming and mega-adventures – look no further. This would work in no other way or format – neither as an AP or as a similarly structured series; Sword of Air is a mega-adventure in the truest sense; This is the benchmark for mega-adventures and truly deserving of being called “magnum opus”. All right, so that’s it – ladies and gentlemen among the designers, developers, publishers, layout-artists, artists, cartographers, you made my year a truly blessed one. Thank you for your effort, creativity, work and, more importantly, for spreading joy to thousands of tables all over the world! My heartfelt congratulations to all winners, though I’d like to emphasize that even a nomination is a HUGE feat in itself! Here’s to 2016 and may it bring us as many awesome books as last year! If you enjoyed this list and my reviews, please consider joining my patreon here! The first sphere-specific expansion book for Drop Dead Studios’ excellent Spheres of Power-system clocks in at 30 pages, 1 page front cover, 1 page editorial, 1 page ToC, 1 page SRD, leaving us with 26 pages of content, so let’s take a look! After an aptly-written piece of introductory prose, we dive into the sphere magic here, which begins with the option-array for metal geomancing via the nature sphere, allowing the spherecaster to draw forth metal from the ground and featuring a rather neatly-detailed table. Have I mentioned that this has the options to magnetize metal and throw it, with maximum item-size influenced and governed by level? On a more critical side (haha) – per concentration, metal weapons may be influences as a standard action to increase threat range, though thankfully featuring anti-abuse caveats. At the cost of an additional spell point, metal geomancy allows the object drawn forth from the earth to take the shape of a closer approximation of the respective weapon or ammunition you seek to duplicate. Similarly, making blades or similar weaponry a kind of magnetized sentry (anti-abuse caveat provided) or forming temporarily your weapon into a whip-like version of itself that can be used to better sunder/disarm/etc. can be considered visually impressive, novel options. Interesting indeed. I am, however, somewhat weary of the hemoglobin ability – allowing for at range Con-damage that also draws forth ore – sure, mechanically generally sound…but still, a pretty nasty one, particularly at lower levels, even with save to negate. Using your command of magnetism to have objects rebound to other targets is interesting. For spell points, you may also temporarily gain the stalwart ability (not StalwarD, as the pdf calls it) and since it’s tied to a resource, I actually am not complaining about it for once- but more interesting, at least to me, would be advanced talents to grant objects regeneration 1 (acid) and yes, fire-forged, frost-forged and similar materials are reprinted for your convenience, which is nice -said holistic approach can btw. be found throughout the book, making it pretty user-friendly. On the advanced talents-side, the pdf goes all out – with freezing geysers (fire, water, geomancing), the insubstantial condition…and yes, you may draw forth geomancy-born elementals with your power. Better yet – after two rituals, the pdf also sports two detailed incantations and information on hallowed druid circles. So, let’s recap from here: We can now actually play with Magneto’s tricks – so far, so cool! The book continues to provide new material beyond that: The archaic alchemist is a Mid-Caster using Int and gains a magic talent each level, sporting also a discovery that allows the class to take hedgewitch secrets…and yep, this replaces alchemy. The warden armorist gets a modified skill list, 4+Int skills per level and may only wear “natural” armor. Instead of quick summons and armor training, the archetype receives the nature sphere (full character level = class level) and also sports an auto-confirm for crits, +1 crit multiplier and disarm-immunity as a capstone. The arsenal tricks introduced are intriguing and make use of material from Dreamscarred Press’ excellent Ultimate Psionics, though reproduced herein for your convenience…and yeah, the material is NICE. The Geosurveyor would be a cool nature-sphere/ranger-crossover with favored packages and is nice. The totemist soul weaver receives a channel devoted to balance: the wounded are healed, the hale are bleeding – with 1/2 max hit points being the threshold and the archetype does get the option use channel balance to add buffs, so-called totem-marks…which can then be dispersed for different boosts…and yes, the playstyle here is pretty awesome. The Yamabushi would be an unchained monk low-caster with a limited spell pool instead of ki, which is also used for powering ki-based abilities. The pdf also sports feats that emphasize the combo-potential: Alloy Creation allows for the blending of creation and metal geomancing; what about better metal geomancy/telekinesis combo-potential? Bonuses when drawing upon both earth and water – interesting. There are a couple of minor hiccups here, though: The feat that grants access to alchemist formulae has this sentence, for example: “You must spend have a caster level with the entire Nature sphere equal to…” – the “spend” is obviously a hiccup and one that does make the feat slightly more opaque than it should be. Or perhaps you want to hurl burning plantlife at foes? Yup, possible. The traits are also nice and properly codify trait subtype – kudos! The supplement also sports new magic armor and weapon abilities – shields with vines granting limited DR, entangling critical hits – the ideas here fit VERY well. Menhirs and trilithons codified as wondrous items may sound cool. The pdf also uses Legendary Item-rules, as pioneered by Purple Duck Games (a formula later used by Dreamscarred Press), here slightly erroneously attributed to DSP as the original source. Anyways, the Changestaff of the Oakling Prince still constitutes an awesome magic item that increases in power over the wielder’s levels. The pdf also sports a bestiary-section, where we are introduced to the Geomancy Elemental Born-template (CR+1) with a sample elemental and multiple Wyrgrove creatures as well as the CR 15 apocalypse rot grub swarm closing the book on a rather high note. Editing and formatting are good, but not as tight as I would have liked – there are some minor, mostly aesthetic divergences from standardized rules-language, with a couple potentially slightly making the material a bit more opaque. Layout adheres to a green-tinted, nice two-column full-color standard with a couple of great full-color pieces I have not seen before. The pdf comes fully bookmarked for your convenience. This is the first of the patreon-based Spheres of Power-expansions and penned by Derfael Oliviera…and unless I am sorely mistaken, this is the first book by the author I have read…and it sure is damn impressive! Considering the complex subject matter of metal-interaction and tricks this pdf requires, the rules-language is often complex and shows some distinct talent. Even in the more flawed instances, the pdf still manages to get across what’s intended and, more importantly, the pdf lacks truly problematic components. Personally, I’m not the biggest fan of the 1/2-max-HP-bloodied style-mechanics since they constitute yet another number to track, but there is precedence for those…and when the pdf uses them, they are justified by the unique things the pdf does. Speaking of which: While certainly not perfect, this book actually proved to be rather inspired in that it does unique things: A whole bunch of options herein simply cannot be reproduced by vancian magic and that is a HUGE plus for me; the combo-tricks and specializations further exonerate this pdf. The complex tricks juggled and overall smart choices made this, as a whole, a more than worthwhile addition to Spheres of Power…and yes, if you’re like me and always wanted to play a Magneto-style character…well, this is it! That being said, this is also one of the cases where I simply can’t rate the pdf as high as I’d like to – the hiccups are there. BUT: At the same time, this book sports basically all those cool subsystems I like (and yes, you can use them sans having their sources) – whether it’s the brilliant antagonize, legendary items or incantations…for me, this increased the usefulness of the book…and it always gives credit where credit is due. With reprints of e.g. swarm traits in a statblock for your convenience, this is a surprisingly user-friendly expansion. So how to rate this, then? Well, in the end, I will settle on a final verdict of 4.5 stars, rounded down to 4 due to the glitches…but considering how much I actually downright love in this book, I will still slap my seal of approval on this, despite the rough patches. You can get this unique expansion for Spheres of Power here on OBS! You can support Drop Dead Studios making these cool books here on their patreon! All right, so we’ve analyzed the types of prejudice featured in the movies and come to a conclusion regarding potential reasons why they simply don’t manage to evoke a pronounced sense of empathy. And granted, I already hinted at my stance towards Magneto. To get my position out of the way – I actually empathized more with him than with Xavier and his X-men, but that may be founded in my fondness for villains and antiheroes in fiction in general. Then, thinking about it, I never felt this way in the comics…so how come? Well, we’ve already established that, both Magneto’s allies and the X-men themselves are a void of positive emotional responses, CGI-powered cardboard cutouts instead of relatable people. Well, Magneto at least is honest in his one-dimensional world-view: In the movies, he is basically a paradox, the definition of ethical hypocrisy. Let me elaborate, in case you’ve forgotten: Magneto, born 1920 in Germany, was once known as Max Eisenhardt, German-Jewish son of a distinguished veteran of World War I and obviously suffered under the rise of the Nazi-regime to power. This traumatic time, ultimately, is used time and again to justify his harsh, jaded world-view…and it doesn’t work. Let’s do some easy word-replacement, shall we? Let’s replace “Mutant” with “Arier” or “Übermensch” in his rhetoric. And BAM, I just Godwin’d the whole argument, didn’t I? Okay, to make that abundantly clear – this comparison is NOT intended to insult anyone, nor should it be seen as me mitigating the subject matter. Know how I mentioned that I consider the movie’s Magneto, overall a hypocrite as well, but at least an open, unapologetic hypocrite? Well, the good Mr. Eisenhardt basically has internalized the very notion that, by virtue of his powers and those of mutants under his command, he has an intrinsically higher value and must therefore be seen as a threat to the populace. This ties into our findings from part II, where we elaborated on the nature of prejudice within the context of these movies. Once again, this also ties into a leitmotif of the comics that the films utterly fail to get. We empathize with the X-men, because they are depicted as “Us” + the X; the mutation. They see themselves as a cohesive identity, yes, but as one that overlaps with ours. We do not empathize with Magneto and his cadre in the comics, simply because he constructs himself and his followers as separate via his powers, yes – but more importantly, via his exceptionalism-drenched rhetoric, a leitmotif that can be ascribed to many of the “big” X-men villains, btw. The movies, by failing to set the X-men up as relatable, deprive the viewer of any means of finding common ground – which makes sympathy, ultimately, boil down to the performances of the actors and the writing for the character. Ian McKellen. Need I say more? In spite of McKellen’s significant charisma in the role as Magneto, there is another issue waiting in the wings, one that would probably piss me off more by virtue of association: Magneto, as we’ve established, basically has a goal of “Us” vs. “Them”, seeking to destroy the regular humans because he considers this the only way forward. The movies, however, also depict him emphasizing the “liberation struggle”, borrowing heavily from Malcolm X’s Black power-movement. And here things get icky. When someone who basically is a mutant-nazi, in all but explicit nomenclature (think about his ethnicity – the persecuted Jew, but also the persecuting German – another reductionist dichotomy jammed down our throats), leads to an ultimately distorted depiction of the exceedingly important Civil Rights Movement and presents a distorted view of current race relations. If we recall the second part of this series, prior to the Civil Rights Movement, Black people would have been mostly subject to contemptuous, NOT envious prejudice as per our categorizations. Beyond the aforementioned problems, this discrepancy shows a crucial lack of understanding regarding the functions of prejudice and its consequences in general. Urgh. This week’s rambling is all about the despicable ideologies in these movies – so yeah, Magneto is basically a nazi-like supremacist. Great. Thing is, the human antagonists of the X-men are no better. They are, frankly, just as bad, only inverted in their stance. And this is WHAT MAKES THEM VILLAINS. Their b/w-thinking, their strict adherence to dichotomous thinking and identity construction are what make them despised villains in comic books and movies alike. Now here’s the catch: The X-men in the movies are just as bad in their own way. Even though oppressed groups viewed by the dominant majority with prejudice are not necessarily sans power, unlike the X-men and mutants, these groups typically lack the physical force or economic/political power to stop their oppression. Considering this simple factoid, Xavier’s agenda becomes downright despicable: The ideology of the X-men in the movies would be one that accepts the envious prejudice placed upon them and puts the blame squarely on the shoulders of the mutants. Some writer must have thought s/he was particular clever when white knighting (get it, white knight, because of Magneto’s rhetoric?) Xavier beyond his role in the books. They missed the point utterly. The point is, obviously, that mutants would have to make accommodations to fit into normal society, sure. But at the same time, this puts the blame on the victimized for their victimization. It’s basically if he had said in the comics: “Your fault for showing your powers!” Ahem…what? When applied to discrimination strategies and forms of oppression in the real world, this notion would but the blame on the Jews for being slaughtered in Nazi Germany, blame Blacks for their struggles in the antebellum South, etc. In fact, and here things get decidedly creepy – that’s what happened. The Nazis DID blame the Jews for their condition; and colonizers and slave-owners all over the world argued that the “uncivilized” would need the firm hand – of non-mutant society or masters. And this notion, mind you, is exhibited by the very central ideological hero-figure of the franchise, the ideological back-bone of the “good” guys. Perhaps that’s why I prefer Magneto in the movies – he’s a hypocrite, but he is openly so. Ideologically, there is frankly not much difference between Xavier and Magneto as depicted – one is a steel fist, the other a steel fist in a silken glove. Both are clenched, but what they have in their grasp differs. Ultimately, both ideologies espoused in the movies, to me, are capital “E” Evil, despicable and fail to grasp the notion of inclusion and non-dichotomous thinking that made the X-men comics as beloved as they were and are. They are an accumulation of negativity, unbridgeable Othering of whole demographies and the tarnishing of a sense of inclusion and the hope to finally belong and be accepted as we are; in short, beyond the basic issues already covered in Part I and II, these are what sinks the movies for me, what makes them, ultimately, the antithesis of everything positive and hopeful about X-men. And personally, I don’t want to stand for these world-views. *takes a deep breath* And that was my rant on the first 3 X-men movies! Next week, I’ll write about an odd movie you (probably) won’t have seen…yet. And yes, next week will be a positive musing. This Miscellaneous Musing was brought to you thanks to my patreons – if you enjoy these posts and/or want me to analyze/pick apart a specific piece of media – drop me a line and consider joining! This inexpensive expansion for the superb Onmyōji-class clocks in at 4 pages, 1 page front cover, 1 page SRD, leaving us with two pages for the archetypes, so let’s take a look! The first of the archetypes (both of which sport a brief paragraph of well-written fluff, just fyi) would be the Grinning Fox. Instead of aid of the minor kami ability, these fellows may choose an at-will cantrip and an at-will orison each day. Additionally, at 1st level, these guys get the Cha-based SP to cast lesser confusion twice a day…and grow their first fox tail, from now on counting as kitsune for purposes of e.g. the Magical Tail feat. The grinning fox receives spirit points equal to his class level plus Charisma modifier and replenishes these after 8 hours rest/meditation. At 2nd level, instead of gaining a shikigami, these folks gain Magical Tail as a bonus feat for the first time, gaining the feat an additional time every 2 levels thereafter. If the grinning fox already has the feat 8 times, he may instead choose one SP granted by it and increase daily uses for said SP by +1. I really like this archetype – in less “magical” worlds, this allows a player to undergo basically a kitsune-like apotheosis without introducing the race, while in high fantasy campaigns, it adds an interesting dimension to the interaction with kitsune: Do they frown upon Grinning Foxes? Encourage them? Perhaps even create them? Nice one! The second archetype would be more complex – the Herald of the Lucky God. These guys exclusively specialize on one of the lucky gods – the lucky gods are listed including their dominions, but here’s the catch – you get the petition of the lucky god you have chosen as a bonus petition as soon as you meet the prerequisites…however, you may never learn the petitions of the other lucky gods. Similarly, whenever the herald gains a class level and meets the prerequisites for the friendship feat associated with the chosen lucky god, he automatically receives it – once again, gods and associated friendship feats are listed for your convenience. This ability replaces aid of the minor kami. The archetype also learns an unique trick: At 3rd level, the herald learns the so-called Lucky God’s Cantrip of the associated deity – and no, this is no 0-level spell. Instead, the abilities are either extraordinary or supernatural abilities, The abilities generally fit rather well with the respective theme of the lucky god chosen: Benzaiten, for example, grants all Knowledge skills as class skills and allows for untrained use of them. Daikokuten gets a pocket dimension that can hold one object of up to 5 lbs. (Hammerspace! ), while e.g. Bishamonten grants an insight bonus to atk and AC when readying an action that is then wasted. While I’d champion a scaling bonus for the latter, you see that the abilities are pretty creative! Have I mentioned “Frequent Dier” that pays for a part of the costs of the spells that returned the character to life? If you’re a DM like me, this will be used OFTEN. And yes, this got a chuckle out of me. Editing and formatting are top-notch – I noticed no glitches. Layout adheres to Interjection Games’ two-column b/w-standard and the pdf provides stock photography of a rendition of the lucky gods, fitting exceedingly well. The pdf has no bookmarks, but frankly, needs none at this length. 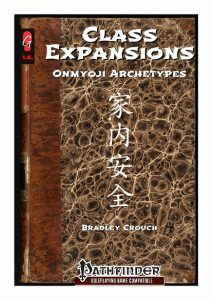 Kidding aside, Bradley Crouch’s expansion of the absolutely SUPERB, brilliant, genius, awesome, buy it now-level of greatness onmyōji-class is short, sweet and to the point. For a single buck, you get two well-made archetypes that certainly enrich the game and add new dimensions to the glorious base class. While I’m not completely blown out of the water by this expansion, it is still an excellent addition, which, at the ridiculously low $1-pricetag, is a no-brainer. MY final verdict will clock in at 5 stars. P.s. : Get that base class! 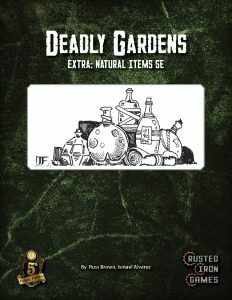 You can get this great pdf here on OBS and here on d20pfsrd.com’s shop! If you like Bradley’s work, you can support him (and get behind the scenes info, a discount on new releases and even have him design your material!) here on his patreon! This installment of the Four Horsemen Present-series clocks in at 10 pages, 1 page front cover, 1 page editorial, 1 page SRD, leaving us with 7 pages of content, so let’s take a look! The sokura’s depiction as a race is more intriguing that one would assume – featuring post-existential philosophy as well as perfect pitch, these somewhat feline, quadruped creatures are akin to centaurs with rhinoceros-like skin. Their tribal culture is intriguing in its blend of science and a scoietal structure generally codified as primitive, creating a distinct area of tension between the two poles and generating thus interest and narrative potential in a surprisingly concise depiction that left me curious for more details regarding the culture of the sokura, which is further enhanced by a kind of infatuation with weaponry and a polygamous and polyamorous structure to their relationships. Similarly, the blend of avian, feline and centaur-like traits is intriguing. Racial trait-wise, Sokura may choose one ability score to which +2 is added, are four-legged with a base speed of 40 ft. and +4 to CMD, always treat Perform as a class skill (and gain +2 to said checks) and are treated as though subject to know direction while on a planet. This one imho should have been codified as SP or Ex and I *assume* from the text that this does not work while in space, but I’m not sure. Sokura can go up to 3 days sans water, 10 sans food without having to make starvation checks. They may also, as a standard action and a Perform-check versus DC 15 share a teamwork feat with 1 ally for 1 round per HD they have…which is pretty powerful for a racial ability. They are proficient with sokura blaster rifles. As far as alternate race traits are concerned, two are provided: Offworlder sokura replace the food/water-related hardiness with +2 to Diplomacy and +1 known language. Prodigy sokura replace the teamwork feat sharing with the Technologist feat. 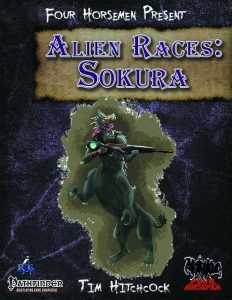 Thankfully, the race comes with random starting ages, height and weight (with entries for both regular and offworlder sokura) and the race is smart in that it codifies sokura as medium, thus avoiding the large-creature-issues and undersized weapon-requirements of the centaurs. The pdf sports 3 racial feats: Survivor provides temperature adaption as well as a further increase of the time during which they do not need to eat/drink/etc. The other two feats are Sixth Sense, which nets blindsense 10 ft. (with a prereq of Blind-Fight) and its bigger cousin, which grants blindsense 30 ft. and blindsight 5 ft. The race also provides FCOs for bard, cavalier, fighter, gunslinger, ranger and skald – no complaints there. The pdf also provides racial archetypes, the first of which would be the Honored Nomad cavalier, which modifies proficiencies to cover simple and martial weapons, firearms, bucklers and light armor and are locked into the order of the nomad at 1st level. Instead of a mount, these sokura get +10 ft. movement as well as Endurance. Speaking of the order of the nomad – the order provides +2 to AC versus AoOs from the challenge, increasing +2 for every four levels the cavalier has. Class skills are Perception and Survival. At 2nd level, the order increases starting attitude by +1 and penalizes the Bluffing against him from friendly or helpful creatures. At 8th level can, as an extraordinary ability, calm emotions of a creature as a full-round action, with a duration that is only maintained while the sokura maintains the expenditure of the required action. Making the save versus the ability offers a means of increasing attitude of the creature affected, though the spamming of the ability is impossible due to a hex-like once per 24 hours per creature caveat. At 15th level, Diplomacy can even be used sans shared language and foes are penalized depending on their attitude towards the cavalier. Over all, a cool idea – tying attitudes with combat-relevant abilities is a pretty rare approach. The Mind Singer skald replaces Scribe Scroll with 10 ft. per class level via telepathy – but only one creature at a given time. Similarly, the raging songs granted by the archetype are hive-mind themed, enhancing the Will of the listeners and providing a telepathic song that grants telepathy to allies as well as sharing teamwork feats at higher levels. 10th level allows for the touching of foes to detect thoughts (immediately 3 rounds of concentration) – nice. 14th level does overshoot the target a bit for less powerful campaigns, allowing for the sharing of a single skill or feat, though at least targets still must meet the prerequisites, which prevents this from being OP. Odd: The honored nomad and mindsinger’s headers sport different formatting choices. The pdf provides two new weapons, the clay shard blades and the sokura blaster rifle (with a nice b/w-artwork). The pdf concludes with advice on how to use the sokura and a sample CR 1/2 vanilla skald (sans archetype), including the neat cover artwork. Editing and formatting are good, though not perfect – beyond the inconsistency regarding header formatting, this pdf has an odd layout-glitch: The first page sports the standard color background…and about half of the page instead has a white background. This is a cosmetic glitch, though. Layout, apart from aforementioned glitch, adheres to a 2-column full-color standard and sports solid artwork. The pdf comes fully bookmarked for your convenience. Tim Hitchcock’s Sokura are an interesting race – though one that does deviate in very minor instances from some established formatting choices. When I looked at the cover, I expected a mess – quite frankly, I have not seen a single quadruped race that truly works…or manages to address the ladder/large-creature-issues properly. The sokura, by virtue of ignoring their extra limbs for all but their base speed, manage to avoid the obvious multiple-arms- and size-issues, which is smart. More importantly, the tidbits we get on their culture actually are intriguing and exciting – they feel ALIEN and still sensible. The tactician-lite racial ability may upset games that are predicated on more conservative racial stats, but at the same time, the race, as a whole, can be considered on par with the more powerful races like tiefling, aasimar, etc. Personally, I would have codified the ability-types of some abilities a bit differently, but that can be chalked up to mostly personal preference. So is the race good? Well, it’s better than the brevity would suggest – it manages to depict a race that feels unique and more than a collection of stats an crunch – which is ultimately the most important component of a race and more than I can say about many racial supplements. Still, personally, I had a strange feeling that the sokura were intended as a psionic race – the mind-song and concepts feel like they could have easily tied in with Ultimate Psionics, considering how the rules in said book have established, precise rules for psionic collectives. A psionic variant at least would have been great to see, though I will not penalize the pdf for the omission of the like. In the end, this is a nice, if brief, racial supplement that manages to rise above the average racial supplement, but also falls short of the potential of the race, mostly due to the brevity of the book. My final verdict will clock in at 4 stars. You can get this unconventional, if brief race here on OBS and here on d20pfsrd.com’s shop! The 5e-conversion of the Phoenix Lily clocks in at 5 pages, 1 page front cover, 1/2 page SRD/editorial, leaving us with 3.5 pages of content, so let’s take a look! After a brief introduction to the subject matter at hand, we are introduced to two magic items: The uncommon specimen jar, which conserves 1/2 cubic foot of material, preserving it. (Yes, including information on putting things inside or drawing forth items.) and the second being the very rare fecund totem: Vegetation within 600 feet of the totem becomes overgrown as if affected by plant growth, which is btw. not italicized in the pdf. The totem also grants all plant creatures +2 hit points per HD, +2 to all rolls and +2 to AC. Creatures marked by the sign on the totem are not attacked by plants unless provoked. The eponymous sample creature herein, the Phoenix Lily, is a CR 4 adversary that sports a limited number of fiery blossoms that wilt upon being used, which they can use to emit fiery rays with a recharge of 3-6 (I assume, the recharge here represents a wilted blossom regaining its prowess). These lilies are vulnerable to cold and resistant to fire and may either attack twice via vines or fiery one of aforementioned rays. Interesting: Upon taking fire damage, a phoenix lily must succeed a Constitution save, with a DC equal to damage taken. On a failure, it erupts in an explosion akin to a fireball, with a damage equal to number of blossoms remaining times d6, Dexterity save vs. DC 15 halves. The plant is included in the targets and all blossoms wilt if this explosion is triggered. On a cosmetic side – the rules pertaining recharge and the wilting of blossoms are a bit opaque: Now I *think* wilting blossoms represent the total maximum of times the phoenix lily can fire its ray, while recharge is determined to denote the downtime required between shots – but one may just as well read this as recharge “unwilting” blossoms – hey, it’s a phoenix lily, after all! A bit more precision in the interaction of these two would be nice. The pdf also provides concise rules for harvesting phoenix blossoms that adhere to the default established in the accompanying FREE pdf and the rules for preserving them are provided as well – though the ever increasing DC means you won’t be carrying a lot of these around for long. Intelligence (nature) can be used to fire them similarly to a one-use circlet of blasting. The pdf also contains rules for glow-emitting fire beetle glands and basilisk blood, which may revert creatures affected by a basilisk’s petrification to their less statuesque forms and, when imbibed, can act similarly to cockatrice tongues as a means to temporarily gain advantage versus paralysis and petrification. Shambler Wafers are pretty powerful: Eating one grants you lightning immunity for one hour and converts the first time lightning damage is taken up to 20 hit points of damage prevented by the immunity into temporary hit points. At 200 gp, this item may be a bit on the inexpensive side, but its harvesting is dangerous enough…so yeah. The pdf also provides means for using basilisk blood and phoenix blossoms as optional additional material components – and the modifications are interesting: E.g. gaining advantage to remove the petrified condition via dispel magic – or rather, that would be interesting…but, alas, pretrification requires greater restoration to remedy and can’t be affected by dispel magic in the first place. Editing has some glitches here – when scorching ray notes “You get one extra ray than normal.” and a multiplying “X” is missing in a spell’s area increase, the bonus damage granted to phoenix lily-powered fireballs is not properly codified as fire damage, lack of italicization of a spell…I can’t help but find myself thinking that editing should have caught this. Editing and formatting are the downsides of this pdf – while formally not bad, they could have used a cleaning up pertaining some components of the rules-language. Layout adheres to an easy-to-read, nice 2-column standard that is easy on the printer. Oddly, one underline of the natural items is purple, not black like the others. The original b/w-artwork provided is awesome for the low price point. The pdf comes fully bookmarked for your convenience. 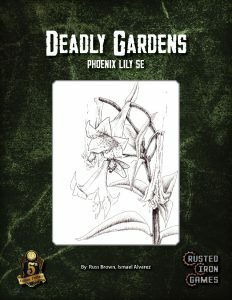 Russ Brown and Ismael Alvarez’ conversion of the Phoenix Lily to 5e is solid regarding the creature – while the recharge/wilting-component imho needs clarification, the creature as such is well-crafted and fun. The supplemental material, alas, ranges in quality, with editing feeling rushed on a formal and rules level – basically, this is a nice, inexpensive pdf hampered by the glitches in the details. If you just want to get this for the creature, go ahead; similarly, I enjoyed the notion of basilisk’s blood being used to reverse petrification caused by them, as this taps into mythology. Still, the power component-section in particular needs some work. Still, for the plant, this is worth the asking price. As a reviewer, though, I can’t close my eyes to the hiccups herein. My final verdict, hence, will clock in at 3.5 stars, though I can’t round up with the accumulated glitches in this brief pdf. The love of lady Myriana of the Shimmerglens, who was brutally ravaged and torn asunder by the ogres of the hook and doomed to undeath, transcended her demise – the nymph refused to fall and was convinced by half-orc/half-shoanti berserker Xnurl Varkul Gunaak Zhulga to become a spirit in order to prevent tragedies like hers. The following describes the requirements and rituals for binding Autumn’s Torn Nymph. Constellation: Skull or Tree – Myriana is aligned with both constellation and can be bound as either. However, any restrictions that prohibit a binder from binding either also prohibit the binder from binding Myriana. -You draw the seal with a mixture of swamp muck, fresh water and blood. -You desecrate the remains of a creature with the giant subtype, preferably that of an ogre. Ceremony: You draw your knife, inflicting superficial cuts over your abdomen and arms to symbolize Myriana’s martyrdom – the red lines glow as Myriana manifests. Manifestation: The seal bubbles and the ground in it becomes swampy – from the misty waters, two spectral claws emerge that, though not connected anymore to Myriana, draw her sodden, drenched and torn spirit from the seal, wet hair obfuscating her face, leaving only one eye open, in which her traumatic death is perpetually reflected. Myriana of the Shimmerglens, lesser courtier of the Seelie Court of Autumn may not have been a “nice” fairy, lording over will-o-wisps and dread swamp-dwellers, but the fate that had befallen her at the hands of the vile Kreegs and their hag allies was something none of the local mortals would have wished upon her. The humanity of her immortal lover stolen from her, she risked falling into the madness of undeath, when intrepid adventurers brought her hope and fulfilled her vengeance. Declining the power she offered as a last gift before opting for oblivion, Xnurl Varkul Gunaak Zhulga convinced her to join the ranks of spirits. Autumn’s Torn Nymph asks but one question upon being summoned forth: “Love or Vengeance?” The binder has to answer this question immediately and without hesitation and explain to Myriana how he is fighting for his own love or that of others, or how he seeks vengeance. When love is chosen, she tilts her head so her other eye becomes visible beneath the shroud of her muddy hair, reflecting the love she felt towards the mortal that proved to be her undoing. She is treated as belonging to the Tree constellation when bound thus. When vengeance is answered, the images of her horrid death in her exposed eye burn bright, instilling pure rage in the binder. She is treated as belonging to the skull constellation when bound thus. However, the binder may also reply “Love and Vengeance” and properly elaborate: Myriana throws back her hair, exposing her duality and emits an unearthly, silent scream that sends ripples through any water within 1 mile. She is treated as belonging either to the tree or skull constellation when bound thus, whatever is more beneficent to the binder. Attempts to bind her thus receive a +5 to the binding check. As a standard action, you can unleash a fraction of Myriana’s former beauty upon a creature within 30 ft. This is a gaze attack and if the creature fails a Fortitude save, it becomes blinded for rounds equal to 3 + your binder level. In addition, you are immune to being blinded by a nymph’s beauty and similar effects and immune to being killed or stunned by beauty. A creature that succeeds its Fortitude save becomes immune to this ability for 24 hours. As a standard action, the binder can stun a creature within 30 feet with a look. The target must succeed on a Fortitude save (DC = 10 + spirit’s level + binder’s key ability modifier) or be stunned for 2d4 rounds. Additionally, the effects of Blinding Gaze become permanent. While bound to Myriana, all natural attacks and unarmed strikes executed by the binder benefit from the ghost-touch special quality. Myriana’s arms have been torn off by the dread ogre brutes advancing upon her demesne, yet her spirit retained control over her severed appendages. Binders of Myriana may, at a cost, benefit from this control. As a full round action that provokes attacks of opportunity, by applying either a blade to the red lines drawn in the ceremony or simply ripping the arm away in a display of strength, binders can sever one or both of their arms in a bloody display. This inflicts 2 points of Constitution damage that cannot be healed for as long as Myriana is bound. Severed limbs may be reattached as a standard action by concentrating and holding the limb to the shoulder. The severed limb is attached to the binder via the threads of Myriana’s might and can freely and quickly dart around the field of battle, allowing the binder to treat melee attacks executed with the severed limb as though the weapon, natural attack or unarmed strike performed with the severed limb had a reach of 20 ft. Unlike other reach weapons, an arm severed thus can freely attack adjacent squares sans incurring a penalty. For the purpose of sundering the severed limb, the limb shares hit points with the binder (healing of the binder affects the limb, both are considered to be one target for purposes of AoE healing and damaging spells), but is a separate entity: After sustaining damage equal to 3 times the binder’s level + the binder’s Constitution score (Not modifier! ), a limb falls to the ground and must be held to the shoulder, where it reattaches and cannot be torn off again for 1d4 x 10 minutes and until the damage incurred is healed. Binders of Myriana requiring maneuverability over toughness can tear off their lower torso as a full-round action that provokes attacks of opportunity, experiencing a fraction of the anguish of Autumn’s Torn Nymph. The binder takes 8 points of Constitution damage that cannot be healed for as long as Myriana is bound. As the binder’s legs and lower torso fall bleeding to the floor, he is kept aloft by Myriana’s power, gaining superb aerial maneuverability and speed. The binder gains a fly speed of 120 ft. with perfect maneuverability.Reattaching the lower torso is a standard action and requires the binder to hold the lower torso to the upper torso. Careless binders using Myriana’s more visceral abilities should take heed – it is Myriana’s might that reattaches the severed limbs and torso. If her spirit is expelled from the binder, he has to bind her again to reattach the severed limbs and is crippled until she is bound again! Physical Sign: Your hair becomes sodden, as if drenched by swampy water and the red lines drawn upon your body emit a faint glow. Personality: You oscillate between melancholy and pure hatred. You have to attempt to stop any violence towards humanoid women, excluding giants, and attack all giants on sight. Favored Enemy: Giants, ogres in particular. Any living creature damaged by one of Myriana’s crows must succeed on a DC 13 Reflex save or be blinded as the crow scratches and tears at the victim’s eyes. The blindness lasts for 1d4 days or until healed with remove blindness. The save DC is Constitution-based. Treat your druid level as your binder level -2 to determine your companion’s abilities. This granted ability replaces Severed Arms. Enjoy! I hope some of you Pact magic fans out there will find this one useful! This installment of the Into the Breach-series clocks in at 29 pages, 1 page front cover, 1 page inside of front cover, 1 page editorial, 1 page ToC,1 page SRD, leaving us with 24 pages of content, so let’s take a look! This review was moved forward in my reviewing queue as a prioritized review at the request of my patreons. It’s been quite a ride since Flying Pincushion Games, then still partnered with D20pfsrd.com Publishing, released their second book (and the first one I reviewed), namely the first Into the Breach: Magus. Well…let’s just say that it didn’t do so well. 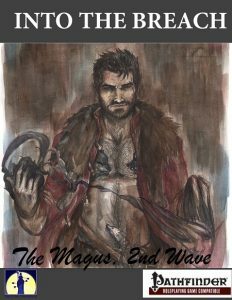 That being said, the crew has learned quite a bit since then, but does this second trip to the magus fare better than the first one? We begin this book, as always, with an assortment of different archetypes, the first of which would be the Arcane Engineer. These guys get a modified skill-list (with all rogue-y related skills like Stealth or Disable Device), 6+Int skills per level and a similarly modified weapon and armor proficiency list. Arcane engineers do not learn to cast in medium and heavy armor at 7th and 15th level; rules-language-wise, stating that in the proficiency section is an unnecessary deviation from standard rules formatting. They also modify their spell-list, but, more importantly, may apply the bonuses granted by their arcane pool to objects and armor, but only to one object at a given time. Starting at 5th level, these guys may spontaneously add a limited list of metamagic feats’ effects to spells by using arcane pool points equal to the spell level adjustment. While this sounds feasible, the rules-language is pretty wonky and deviates in many regards from how such mechanics usually are phrased. Starting at 2nd level, these guys may channel spells through equipment – they may, e.g. get an Acrobatics bonus equal to his class level when casting “movement enhancement spell on an item worn on his feet item slot.” *SIGH* For how long? Does non-magical equipment qualify? What constitutes a “movement enhancement spell”? Define. What if he has no item on the feet-slot? Doesn’t work as written. To make up for that, targets of their spellstrike may save, even if there is usually no save. OUCH. Wait…what’s the save? Fort? Ref? Will? No idea. The archetype also has a significantly expanded arcana section, allowing them to convert spells into arcane pool points – and no, they can’t be retrieved via spell recall or improved spell recall. This severely de-limits the arcane pool – and fails to specify whether multiple instances of the same spell prepared also mean that the respective spell can’t be recalled. Cosmetic, sure, but still. On the cool side, counting as having the quick trapsmith rogue talent while under the effect of haste can be considered to be an interesting synergy. Regarding almost humorously bad editing glitches: “When channeling the monkey fish spell through a wrist or belt slot item, the arcane engineer may ignore the armor check of light armor when climbing or swimming and add +5 ft to his Swim or Climb speed” Spot the glitches, ladies and gentlemen. Yes, beyond there being a “penalty” missing. Btw. : The maximum ACP for light armors…is -2. Another also nets the following gem: “[the shirt through which a spell is channeled] automatically gains a Heal skill check using the arcane engineer’s Heal skill modifier +10 to attempt to stop bleed damage.” So, does the item gain an action? Does this happen immediately? As an action? Things get more wonky – “+8 to the Fly skill as though the arcane engineer were a flying creature.” URGH. Does this stack with Fly speed’s bonus? The bonus granted by the required spell, overland flight? No idea. This whole archetype is a neat idea, but not functional – it takes a complex concept and tries to beat it into a class chassis not intended for its use…and its wording is sloppy. The second archetype, the Ebonheart Magus, adds several death-related spells to his spell list, namely death knell, death knell aura and bleed. Starting at 4th level, these guys may expend 1 arcane pool point as a swift action to, for one minute have all touch-range spells dealing hit point damage deal 1/2 their damage as negative energy damage, granting the magus “temporary hit points per level of the spell cast while this ability is in effect.” These stack to a maximum of twice (thrice at 11th level) the magus’ level and last 10 minutes. The plus-side here, is that death knell and this ability’s temporary hit points are properly working in conjunction. The downside being that the magus gains these temporary hit points only once per spell cast. At 11th level, this ability extends its benefits to ranged spells – and here, things become very wonky: What about AoE-spells? Do they grant multiple temporary hitpoints? Technically, they’re one “cast,” as the ability calls it. At 7th level, these guys may spend one point from the arcane pool to cast death knell upon reducing a foe to -1 hit points via a melee attack or touch-range spell as an immediate action. This ability gets an upgrade at 16th level. The archetype pays for these benefits with (improved) spell recall, the knowledge pool and counterstrike. The archetype gets 3 arcana for leeching blades. At 9th level, these guys can expend temporary hit points to properly heal or even regain prepared magus spells. I like what this archetype tries to do: using temporary hit points as an alternate resource and tying it to the limited resources spells, hit points and arcane pool. Unfortunately, there is a reason for why this is usually not done – there are more ways to gain temporary hit points that can be exploited rather hard. Beyond the rules-language hiccups, this means this archetype will not get near my game. The next archetype is the elemental champion – these guys lose (improved) spell recall and knowledge pool. To make up for this, these guy increase energy damage output and may expend arcane pool points up to Int-mod to change the energy types of spells prepared, with 11th level providing only the fly energy type change. Pretty much the epitome of boring elementalist. The Fate’s Edge can’t spend arcane pool points to enhance his weapon, but may spend 1 point from the renamed Prescience Pool as a swift action to gain a +1 insight bonus that can either be applied to atk and damage or to AC and saves, increasing by +1 at 4th level and every 4 levels thereafter. The total bonus can freely be divided up between offense and defense. 5th level provides uncanny dodge, 10th level its improved sister ability. At 7th level, while already in prescient combat, the fate’s edge may, as an immediate action, spend 1 point to reroll an attack or save and at 16th level, the archetype may force a creature targeting the fate’s edge or saving versus a spell or effect generated by the fate’s edge to roll twice and take the lower result. Arcana-wise, rerolling damage dice , rolling twice for initiative and spellbooks expanded with some divinations are pretty much what I expected. Mechanically, this one is pretty sound, but it won’t win any innovation prizes – these are literally the default tricks in that category. The Force Bulwark is, mechanically, perhaps one of the more intriguing archetypes herein – instead of spell combat, these guys gain the ability to create barriers of solid, visible magical force. This barrier, 5′ square, has hardness equal to Int mod and hit points equal to 5 + cless level x 2. Versus energy damage, hardness is instead treated as energy resistance, retaining vulnerability versus these. The barrier provides cover and may, providing circumstances are right, even grant total cover. The barrier must be anchored but doesn’t have to be vertically anchored. It can hold 100 pounds per caster level and has a range of “close” – I *think* that should be “short (25 ft + 5 ft./2 levels). At 4th level and every 3 levels thereafter, the character can create + 1 5′ square barrier, which must forma single continuous plane, though the barrier shares hit points. The barrier is activated as a standard action, costs 1 arcane pool point and remains for 1 minute or until destroyed. A force bulwark may only have one such barrier in place at a given time. This replaces spell combat. At 8th level, the barrier can be formed into rough geometric forms (more precise wording would have been nice here) and the barrier may halve its hit points to extend to twice the area. At 14th level barriers need no anchor and 20th level eliminates the one-barrier at a time restriction. There are 4 exclusive types of arcana, which include AoE bull rushes versus attackers that destroy the barrier, minor retributive damage, fast healing barriers and more hardness that scales with levels. I really like the idea of this archetype, but its execution leaves a bit to be desired – the barriers generally are pretty weak and easily broken. While the complex concept generally is cool, it suffers from the limited space it has to shine – this should imho be a more detailed base class. Still my favorite so far. The Mistblade may, as a standard action, spend 1 arcane pool point to create an illusory duplicate of himself that can move anywhere within close range of the creator. The duplicate is correctly coded as a figment and has an AC equal to your touch AC. The double is destroyed when it takes any damage. Unfortunately, the ability fails to specify the save DC to disbelief the double, which is important since non-disbelieved doubles can act as flanking partners. Duplicates can speak and changes to your appearance etc. affect the double as well. At 3rd level and every 3 levels thereafter, the class feature grants +1 double, all of which must be destroyed or disbelieved separately. Odd: 5th level specifies that the doubles can now be directed as a free action, when prior to that, no action is given regarding directing the doubles. This replaces the magus’ ability to enhance weapons with arcane pool. 2nd level and every 3 levels thereafter provide sneak attack progression instead of spellstrike. The higher levels allow for the disbelieved duplicates to be reset as a standard action and 10th level allows them to affect the physical world as though they had a Str-score of 10, with the mist-blade’s BAB + size modifiers as atk, with damage equal to the weapon’s base damage sans enchantments, feats, abilities, etc. at 13th level, the mistblade can swap positions with a duplicate as a swift action. The ability lacks the note that it is a conjuration [teleportation] effect for purposes of ability interactions. They do lose medium and heavy armor and fighter training for these tricks. The arcana allow the mistblade to see through duplicates and poach among rogue talents and ninja tricks. All in all a thematically awesome, complex archetype that almost gets its difficult subject matter right. Primalists get diminished spellcasting and may only use spell combat in conjunction with natural attacks or unarmed strikes. He may not enhance his weapon via arcane pool and instead gains primal shift that costs 1 point from the modified pool and can be activated as a standard action (swift action at 4th level). The shift lasts for one minute; it is properly codified as a polymorph effect: Every level, the character gains a number of evolution points that can be used to gain a limited array of evolutions; the evolutions are fixed each level, but can be reassigned on a level-up. The abilities of the archetype focus on modifying spell combat et al. for natural attacks/unarmed strikes, limited natural armor and modifying expanded spell list-abilities to refer to the druid spell-list instead of the wizard’s. The arcana allows for reactive shifts, for example. A slight problem here lies in the utterly deadly combo of feral combat, spells and evolutions – the combo makes you a brutal shredder and the archetype, generally, is very, very strong. It still is okay in high-powered campaigns, but any halfway decent minmaxer will make a devastating beast out of these guys. GMs concerned with balance may want to be careful regarding this one. The Pyroclastic Mystic has a cool name…and gets more fire spells, fire resistance, uses fire-forged steel, a cloak of ash, may sculpt fire damage spells…and takes until 11th level until it finally gets a means to reduce resistance…which may be a bit later. 5th level or even as soon as 3rd would have probably been a good idea. Overall one of the more visually interesting elementalists…but still, not really that cool. The Spell-torch Savant looks, at first glance, like yet another one of these…but is interesting: These guys can spontaneously convert spells into a fixed list of divinations while wielding a torch and they attack with torches – when delivering touch spells with their torches, they add fire damage contingent on spell level and make the targets burn, scaling DC to resist and put out – which is pretty brutal. Thankfully, the fire at least can’t spread. At 4th level extend this to ranged touch attack spells. Higher levels provides options regarding wind-resilient torches and instead of bonus feats, they can pose yes/no questions to their torch, brandishing it; if the answer is yes, the flame flares. I…actually love this one. The mechanics are unique and powerful, but the archetype is balanced pretty well…and makes torch-combat actually feasible and evocative – certainly an interesting class I’ll use in my darker games. The towering champion gets a reduced arcane pool…and is interesting as well: These guys may enter massive form, increasing their sizes and gaining attribute bonuses, natural armor and later even DR. The abilities are codified properly and size benefits are listed for your convenience. Giant-themed abilities like rock catching are provided and these guys get a choice – either be a protector or marauder. This choice determines whether the form features a buff for allies or debuff for foes (it can be changed each level) and the archetype can grapple foes with one hand. I like the visuals here; I also like the execution – a 11-grade distinction between massive forms means that they generally are level-appropriate regarding their balance. All in all, a good archetype, though a bit light on the player agenda – still, one of my favorites herein. I’ll probably use this one sooner rather than later. The next one would be the waystrider – no arcane pool weapon enhancement, but instead close range, arcane pool-based teleportation (properly codified – YAY! ), with higher levels increasing range. The archetype also gets evasion, tagging along on teleportation and a somewhat erratic last second save teleport that staggers him for one round, but may save his life (or teleport him in a solid object, but oh well…). The arcana allows for the ignoring of line of sight, an afterimage and improved evasion. Know what? I like this. It’s a solid teleporter-skirmisher archetype that does everything right. I have recently built a similar teleport-themed archetype…and have to say, I couldn’t have done this one better. Credit where credit is due – this is awesome. The whip weird gets a modified spell list and is the unpretentious whip-expert, with arcane pool powering temporary deafening strikes (later entangle and constricted), appropriate feats and proficiencies. This does not reinvent the wheel, but certainly is one of the better takes on the whip specialist I have seen, with sufficient precision in the rules language – again, kudos. The pdf provides PrCs as well, the first of which would be the Anthropoarion, which requires the hummunculist archetype and gets d8 HD, 2+Int skills per level, 3/4 BAB-progression, 1/2 Fort- and Will-save progression as well as 9/10th spellcasting progression, with each level choosing arcane casting or extract progression. Every level nets an arcana or an alchemist discovery. The PrC’s levels stack with hummunculist for purposes of experimentation and he may use bombs in conjunction with spellstrike “as a full-round action”. Does that mean full attack with bombs only? Or one bomb + spell? This needs a bit of clarification. AT higher levels, these guys can dimension door their homunculus, later switch locations with it. 9th level lets “the homunculus cast spells on behalf of his master as though he were his master” using the master’s slots, but not actions…okay…so does it have to be commanded to do so? I assume no, but I’m not sure. As a capstone, the homunculus replaces BAB and HP with that of an animal companion and gets a huge boost to mental attributes, spellstrike and 1/2 the master’s arcane pool. if the master dies, he “awakens the next day as the homunculus until returned to life” – which is cool…but what are the mechanics for this transition? Switched mental attributes? Total transposition? No idea. The second PrC would be the erudite blade bravo, who gains d8, 2+Int skills per level, some exotic proficiencies, full spellcasting-progression, 1/2 BAB-progression, 1/2 Ref- and Fort-save progression. The PrC provides full synergy with magus levels for purposes of arcana prereqs and may power mage hand with arcane pool points to wield weapons, though that requires swift action concentration. The one thing unclear here is whether the mage hand then threatens squares – I assume so, but I’m not perfectly sure. The PrC provides scaling AC-bonuses when wielding daggers, dagger-themed spells added to the spell-list and use Int instead of Str for damage, but thankfully with anti-cheese caveat. Better thrown range for daggers and a non-stacking, arcane pool-powered flurry complement this one. Overall, a rather interesting, overall mostly well-crafted PrC. At this point, layout changes from the 2-column standard to the 1-column standard and the pdf sports a new Metamagic feat, adding smoke to spells. The feat has a cosmetic italicization glitch. Finally, the pdf offers 5 new spells – blazing shiv conjures basically a lightsaber and erroneously refers to “casting statistic,” a term that does not exist in PFRPG rules language. Burrowing Blade lets you enchant light piercing or slashing weapons to embed them in foes and have them continue to burro into said foes – NICE! Cinder Fall is textbook power creep – it ignites flammable material and clearly outlines invisible creatures – sans penalty like glitterdust, making the spell better in that regard, though it is a level below that. Storm Spike is an electricity-based light saber and suffers from the same glitch as the former one. Wall of Smoke nauseates, obfuscates and can even deal nonlethal damage – overall, a cool spell. Editing and formatting are still okay on a formal level; I noticed a couple of italicization glitches and the like. Rules-language is a different topic: It frankly oscillates between “This doesn’t work -at all!”, “this works but deviates from how it’s usually worded” and “this is remarkably precise for the complex concept used.” All in all, though, this pdf could have definitely used a tighter hand in development and the book shows the hands of 4 developers, some of which, reluctant though I am to state this, botched the job. Layout adheres, for the most book, to a 2-column standard, switching to a 1-column standard for the spells and feat. Artworks are gorgeous and full-color; while some stock pieces are there, I have never seen most of them and they tend to be very beautiful. The pdf comes fully bookmarked for your convenience. Frank Gori, Jacob W. Michaels and Taylor Hubler can do better. I’ve seen all of you do better and this pdf does sport some of the components I really wanted to see; there are a few gems herein, but the often problematic rules-language tarnishes some of the admittedly challenging concepts herein. That being said, while not the best work of Flying Pincushion Games or the authors, this indeed is better than the first magus-book. Still, over all, this is a frustratingly mixed bag of a book; if the rules language had received the required polish, this would have been an impressive book; as written, it is a rollercoaster ride between elation and frustration due to the grit in the gears of the finer rules. My final verdict for this one will clock in at 2.5 stars, rounded up to 3 due to in dubio pro reo and the fact that the gems herein do not deserve being bashed – it’s a mixed bag, but it has its gems.